When it’s time to get your meat processed, the closer to where you shot your animal the better. Luckily, a variety of high-quality meat processors bed down right here in western Colorado, ensuring you can enjoy the spoils of your hunt without spoiling your game. Twenty-four hours per day, seven days per week, Elk River Custom Meats supplies the needs of Yampa Valley hunters. Located at 2464 Downhill Drive, the business has been in operation for nine years, with owner Dan Bubenheim available 24-7 to assist hunters in the field. “Anyone can reach me on my cell phone (970-846-7642) at any time,” he says. The pickup service, he adds, is particularly important during bow season. “We’ll get out there and get the animal in before it gets too hot,” he says. Steamboat Meat & Seafood Co.
A longtime winner of Steamboat Springs’ annual Best of the Boat contest, and recipient of numerous grand-champion awards for its bacon, sausage, hams and summer sausage, Steamboat Meat & Seafood Co., a USDA-inspected, HACCP-certified facility, has been operating in Steamboat Springs since 1982 (it purchased O.K. Meats in 1999 and changed to its current name). Located at 1030 Yampa Street in downtown Steamboat, the company specializes in big game processing, including elk, deer, antelope bear, moose, mountain lion and buffalo and boasts more than 25 years experience. Services also include custom meat grinding and a variety of sausages and jerky. The company offers 24-hour-per-day access to its courtesy cooler for after-hours drop-offs. Hamil says the business’s success owes itself to quality. “We have the finest, cleanest workmanship around, and we process for a lot of the big outfitters,” he says. Dan and Michelle Gillian are the husband and wife team that put the D&M into D&M Meats. The Grand Junction business is in its 17th year, recently relocating to a new 3,000-square-foot facility at 1301 20 Road near Fruita. “Hunting season is a huge part of our business,” Dan says, noting they’re processing more elk now than deer. 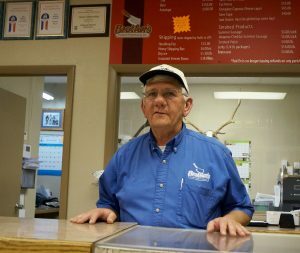 “With wild game, we cut out as much of fat as possible and take out all the bone.” He adds quality and customer service is what they keep in the crosshairs. And rush service for out-of-state clients is no problem. “We can get an animal in the early afternoon and have it ready and frozen the next morning,” Matt says. Brother’s Custom Processing owner Dave Satterwhite mans the counter at Brother’s Custom Processing. Brother’s Custom Meat Processing, at 383 East First Street in Craig, offers full game processing as well as selection of award-winning retail products. Owner Dave Satterwhite says his business can handle any northwest Colorado game as well as livestock. “We get trophies ready for hunters to take home, we ship, and we make different sausages,” he says. Brother’s has been operating for 17 years and has won numerous meat processing awards. The business received four Grand Champion honors for its smoked turkey bone-in ham, specialty wild game and bacon, as well as Reserve Grand Champion for large diameter luncheon meat and meat snack sticks and a champion distinction for jerky. “We’re just doing a good job,” Satterwhite says. At Mountain Meat Packing, processing is the family specialty. 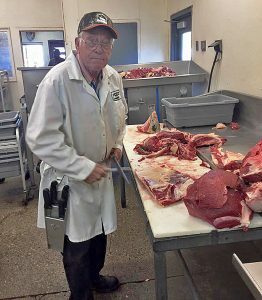 Four generations of Baysingers have offered game and livestock processing services to the Craig area since 1977, with the company recently celebrating its 40th anniversary. Because of the connection to the family name, Mountain Meat fosters an expectation of excellence. “Our name is kind of on the line there,” co-owner Jeff Baysinger says. Jeff’s grandfather, Loren Baysinger, started the business and at 86 he still helps out around the shop. 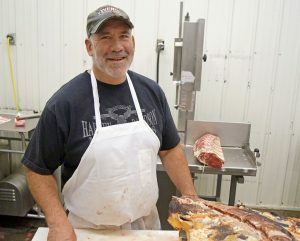 Located at 291 Lincoln Street in Craig, Mountain Meat can handle any type of northwest Colorado game, minus poultry, and also processes livestock. It also offers specialty sausages, shipping services and a selection of retail items. “We can accommodate whatever hunters’ needs are,” Jeff says. The name says it all for Craig’s Custom Quality Meats; they process to perfection. “We custom cut it the way you want it,” says owner Dave Tafoya. Tafoya has processed most every big game animal in North America and can handle whatever hunters bring in. Despite experience with ostrich and other birds, he doesn’t process poultry. “I don’t deal with anything with feathers,” he says.